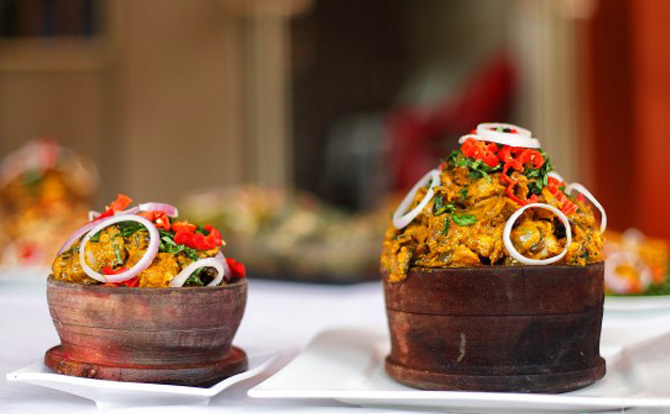 Nkwobi is simply cow leg or tai inside palm oil sauce. Your cow leg should already be cut into byte pieces and washed. Now you set it to boil in a pot adding some onion and Maggi. It is better to use a pressure cooker because cow legs can take up to 4 hours before it becomes soft. Make sure when its getting soft you allow the stock dry up so that the cow leg absorbs every spice. It will be yummier! Now we have to make the palm oil paste. Add enough palm oil in another pot, mix your potash with a bit of water then sieve. Open up the local nutmeg, place on a pan or the cooker to get hot for about 3 minutes (till it becomes fragrant) mash, then add to the palm oil. Add Maggi to taste, some pepper, a bit of salt, enough crayfish and mix together. Make sure you taste it. Now wash your ugba and add it to the paste. Mix everything together. Get the cow leg and add to the palm oil paste, when it is totally combined, put it back on the cooker till it heats up. Should not be more than 5 minutes if not the oil will melt and you don’t want that. Serve your nkwobi in a plate and garnish with the Utazi leaves and onion rings…it should look like what I have below. Utazi is bitter so some people use sparingly by sprinkling on the top of the Nkwobi, while some combine it all. It’s entirely your choice. This sounds really interesting! Cow tail is not something I’d normally order all for myself, but I would definitely give it a try. I literally googled the pronunciation of Nkwobi! Hihi. I’d love to try it too. I’m going to print this and ask my grandma to cook for me. Thanks for sharing! OMG I didn’t even know that the cow leg was a part of the animal that we even ate!!! But, this recipe looks and sounds so good! I wouldn’t mind giving it a try!